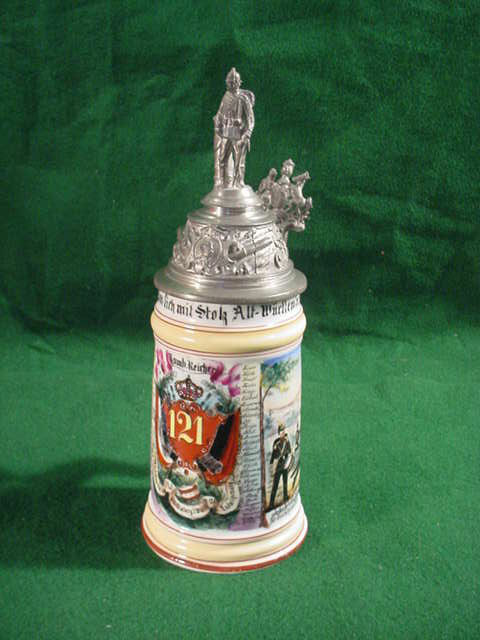 The Ultimate German Collector's "Collectable"
My customers should go first to steincollectors.org to read the excellent article written by R.Ron Heiligenstein, SCI Master Steinologist and author of Regimental Beer Steins 1890-1914. 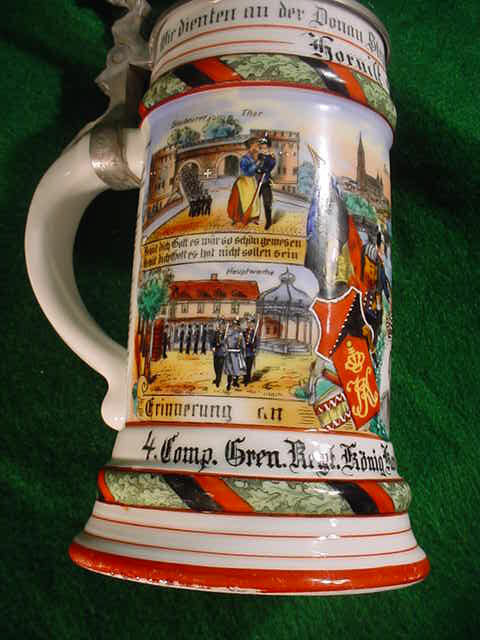 This is the November Stein of the Month and beautifully describes the definition of a Regimental Beer Stein. 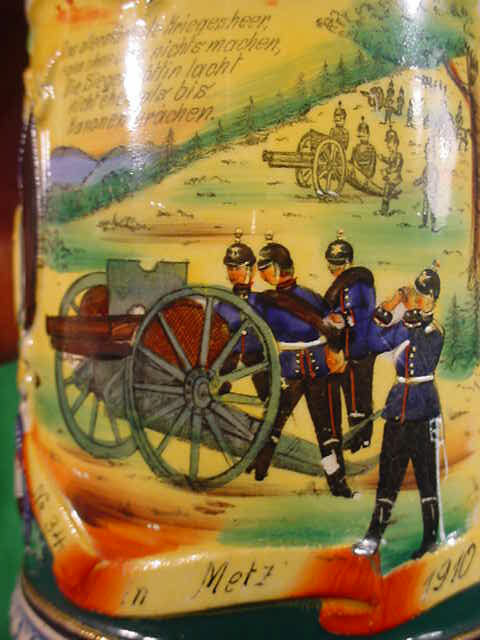 If any one thing captures the spirit of Imperial Germanys Armed Forces in beautiful fashion it has to be the Regimental Beer Stein. 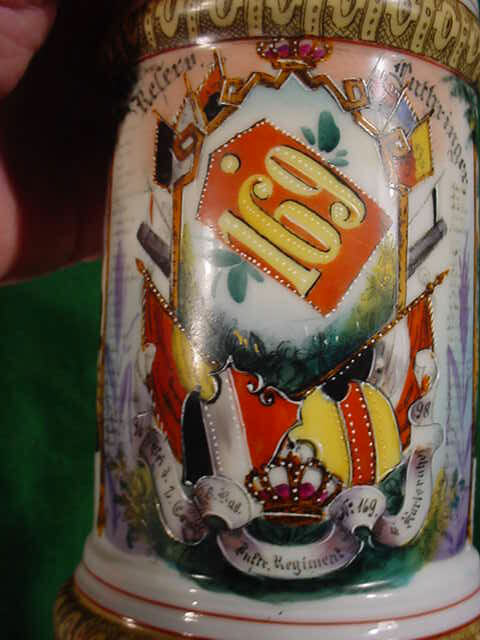 Whether made from porcelain or pottery the Regimental Beer Stein was the symbol of patriotic loyalty to the fatherland, or to a regiment from one of the various lands in the German empire. 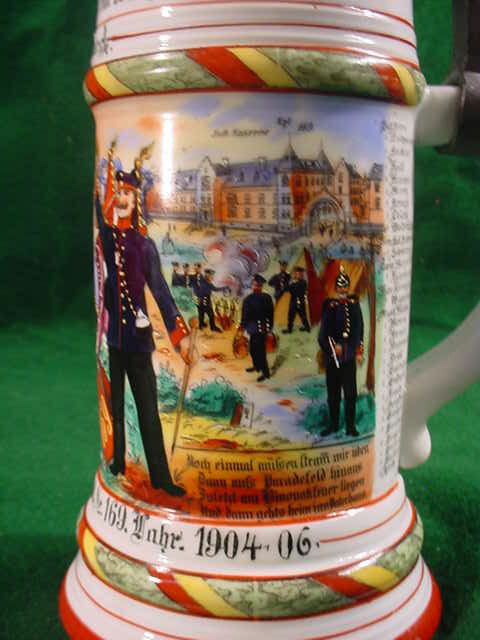 The regimental beer steins came in with the upsurge of German nationalism and pride in the success in the Franco-Russian War and a young popular emperor Kaiser Wilhelm II began an expansion of Germany’s military system in 1888. Military service was originally for men 17 to 45 years of age. The tour of active duty was 3 years for Calvary and Navy, and 2 years for others. Upon completion of their active duty these men became reservists. 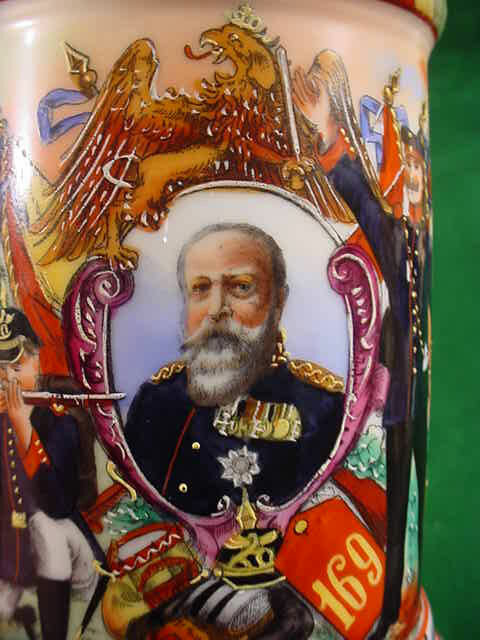 It is the reservists and not the professionals who carried souvenirs such as steins, pipes, flasks, beakers, cups, swords and many other items. All reservists reported to their units in October and all ”Graduated” with the same “Class” in September. 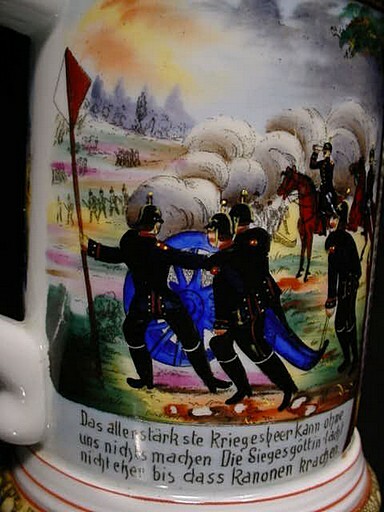 The cost of regimental steins depended on their uniqueness. 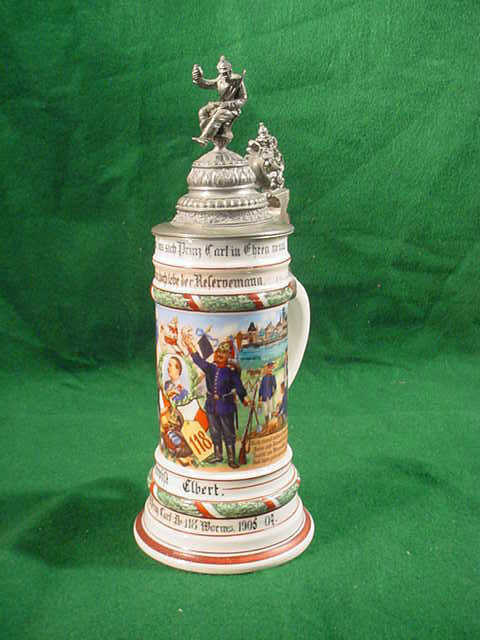 Some of them for example might be two or three times the cost of normal military commercial steins. But pride in their class and unit was downright enormous and in cases when it has been recorded all the reservists earned steins. 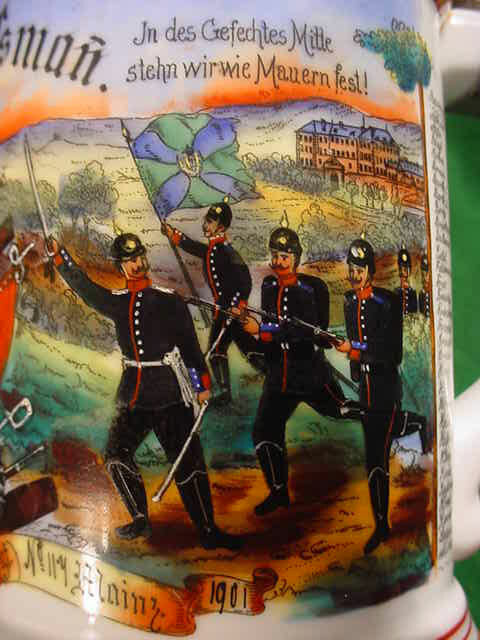 Regimental Steins were usually produced in porcelain, occasionally they were of pottery or stoneware or very rarely of glass or pewter. The decorations generally depicted typical training scenes, portraits or rarely combat scenes. 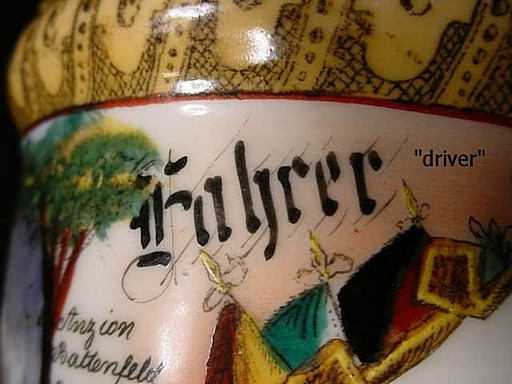 The glazes on these steins included great varieties of color and brilliance. This art for the most part has been lost and cannot be duplicated. (A lost art!) The decorations were primarily transfer decorated, that is the designs were printed on silk screened decal that was put on the body, touched up and hand fashioned, then fired. 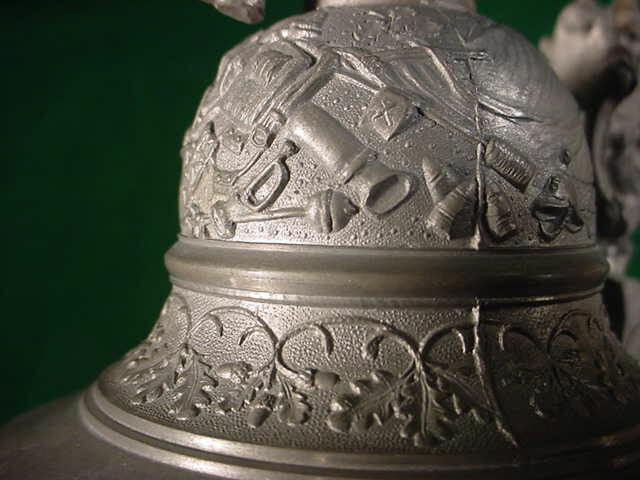 The pewter work on most regimental steins is both elaborate and meaningful. 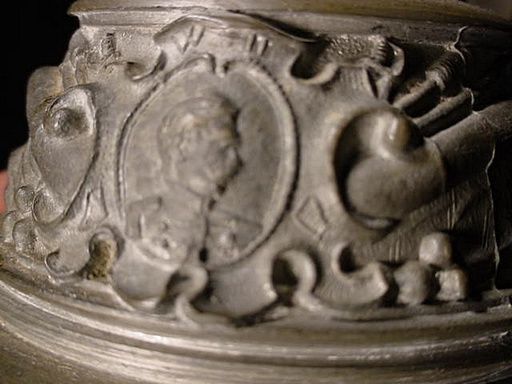 The lids, the finials, thumb lifts are symbolic of the areas, scenes or national emblems and human figures, cannons, helmets, crowns, eagles, griffons, glass tops, etc. All are seen on these magnificent mementos. Sayings that are catchwords for the units are often included such as “Cannon Thunder is Our Greeting” or “when we the Guarde ď Corp attack it strikes fear into the hearts of the enemy”. 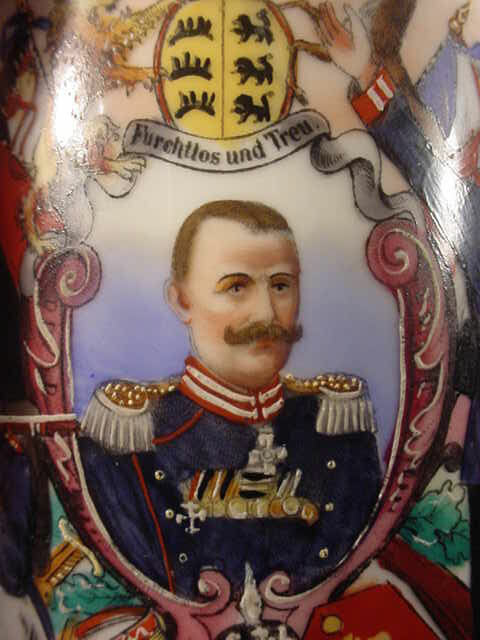 Most porcelain steins have lithophane bottoms mostly depicting a soldier and maiden, home scenes, nature, and outdoor scenes, busts of Kaiser William, King Ludwig and Naval Scenes. 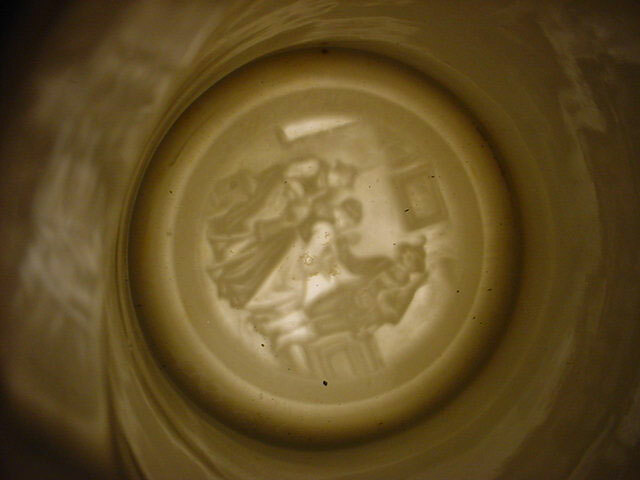 Lithophane scenes were translucent pictures seen when holding a stein bottom up and looking inside. 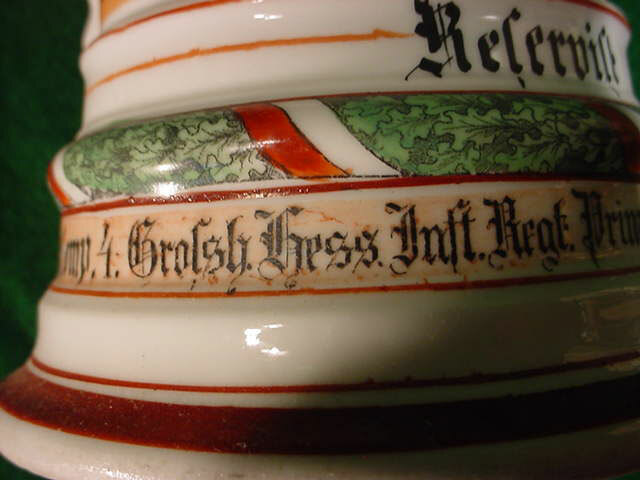 The meaning for this was basic in that it was used to provide different thickness to the porcelain creating a variation in the translucent nature of that portion of the steins bottom. Providing a scene so as to be collected by beer drinkers. It was an invention of the late 1880’s. 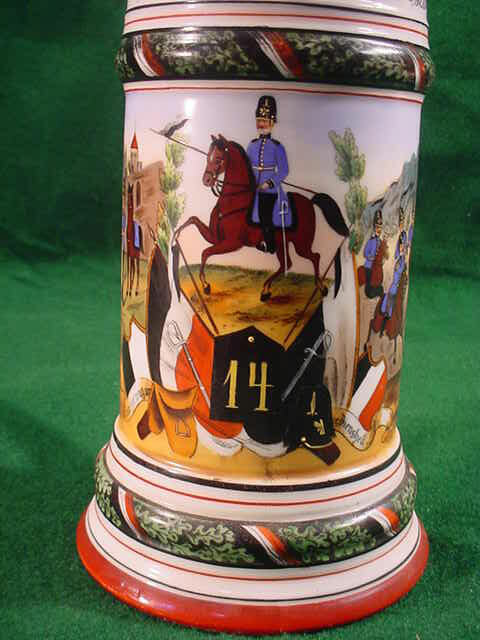 Hussars, dragoons, foot soldiers of the infantry, guard regiments, grenadier, engineers, sailors, train battalion soldiers, machine gunners, artillerymen all loved these steins and brought them forward. 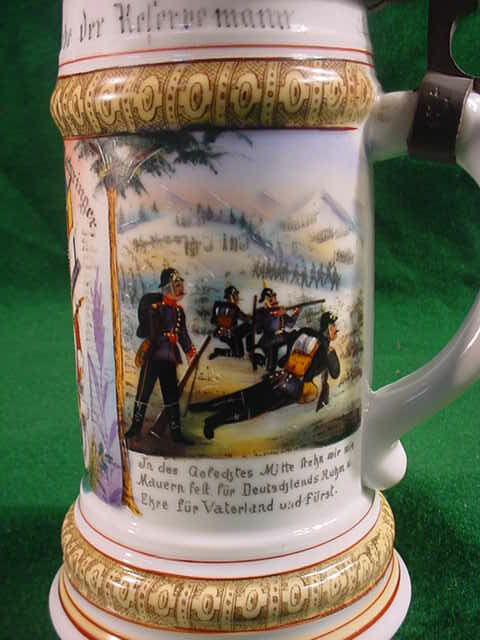 The German Regimental Beer Stein will forever be the sacred spirit of the age of Imperial Glory. ACHTUNG! 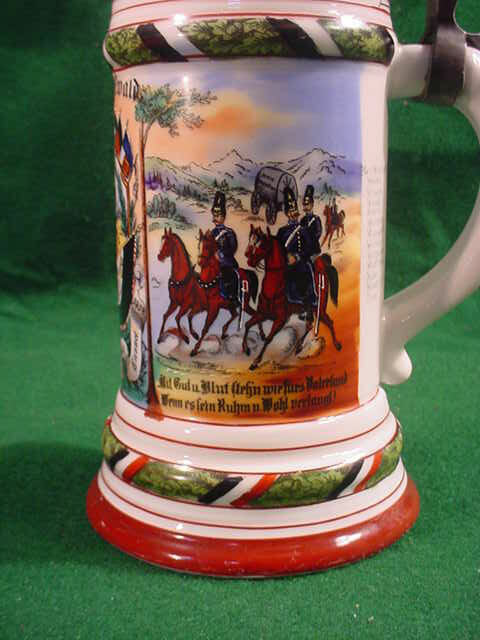 We are running a very special sale on the military steins in this department. Please do look them over as they are all very special and mostly from one of the finest collections ever assembled in the U.S. All are original period pieces unlike some that are seen on other sites. 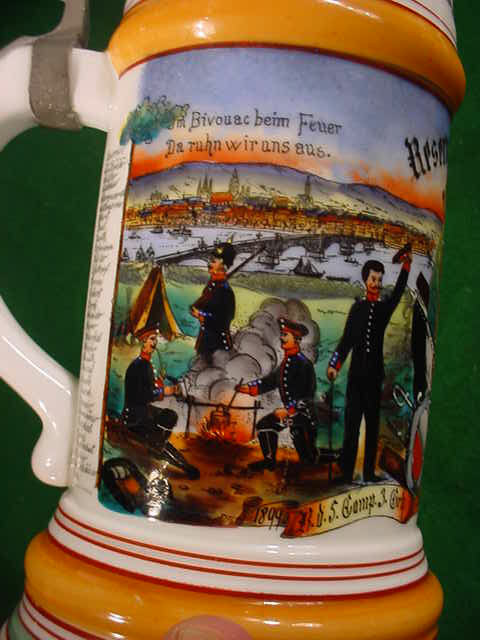 DESCRIPTION: A beautiful 1/2 liter stein with great scenes of campsite and field training. To a reservist Reichert. 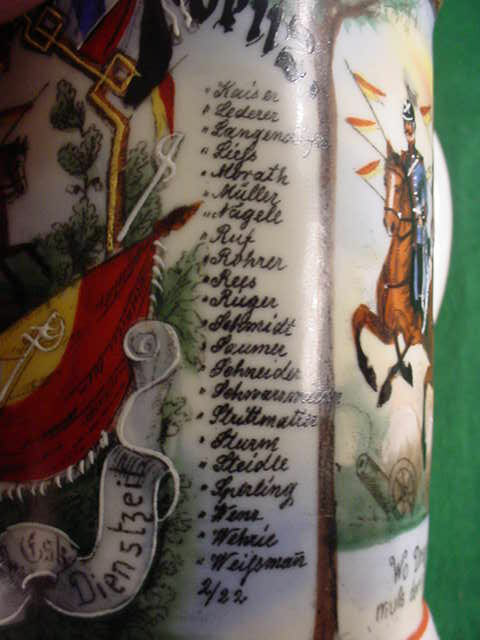 The saying at the top translates to “We highly love our regiment exclusively with pride as old Württemberg calls!” Down each side are listed of course the names of his comrades in the regiment. Under the scenes are patriotic and military sayings. 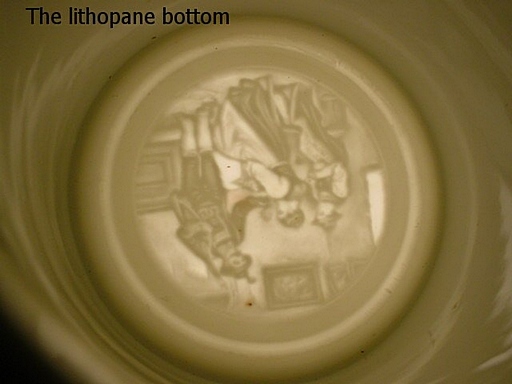 The nice clear lithophanne bottom depicts a home scene of a family in typical setting. 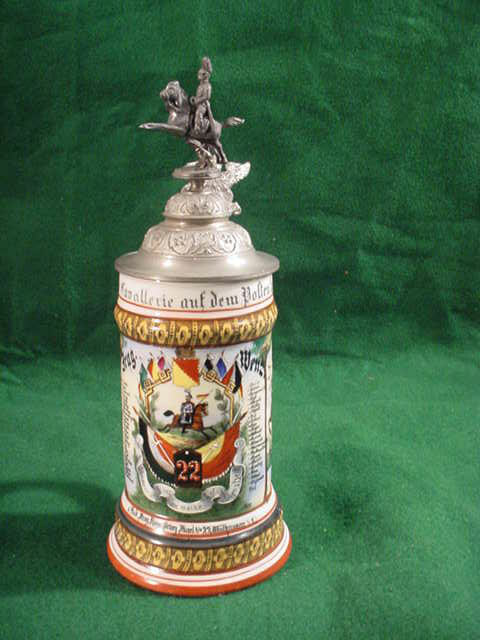 A nice stein in great condition. 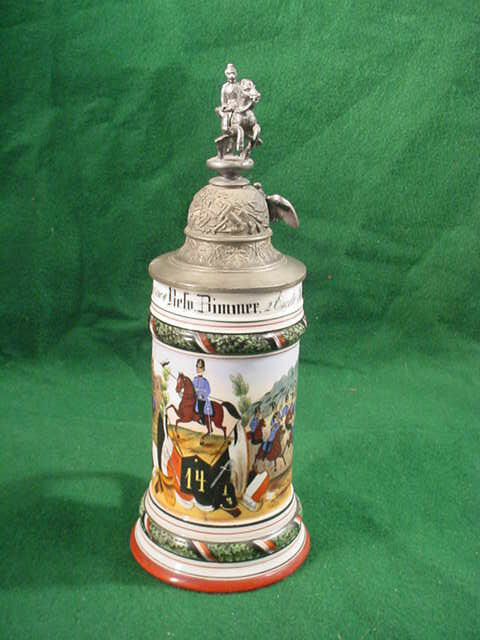 Has Württemberg crest thumblift and soldier finial. About 11 ¾ inches high. 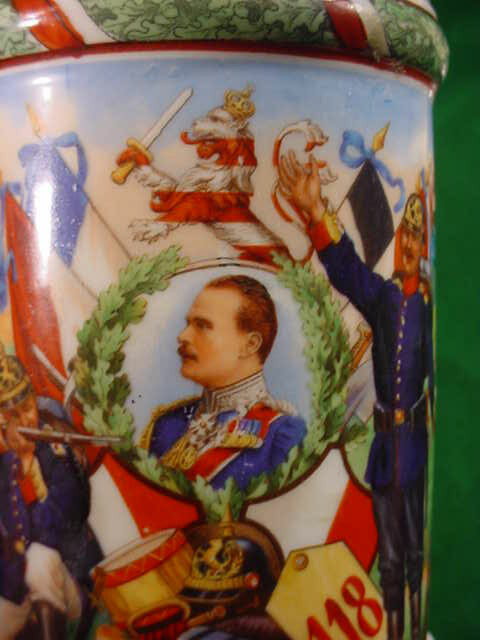 DESCRIPTION: This stein is in perfect condition and is the porcelain variety. Besides the decal process it has much hand finishing. 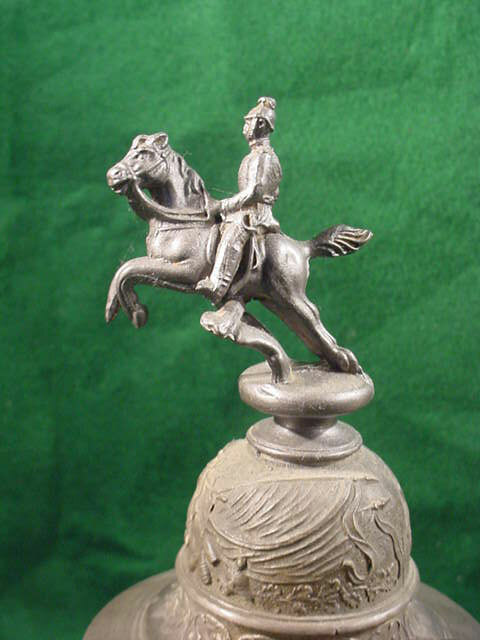 Calvary whether Uhlans, Hussars or Dragoons are always especially desirable. 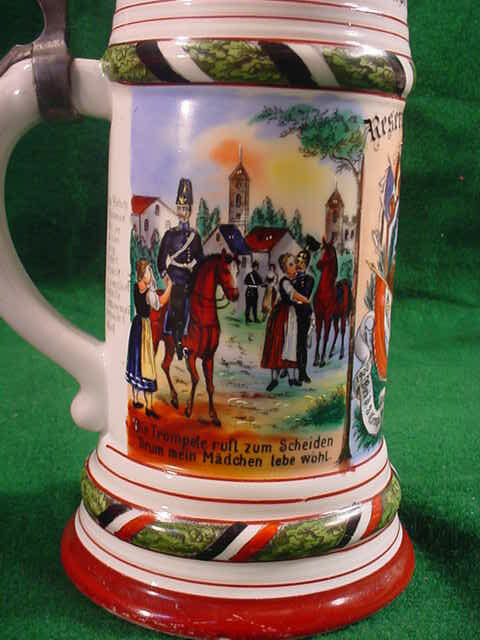 This one is no exception to that established rule and it certainly is an exceptional stein with rich coloration and nice clear scenes of goodbyes to the maidens (Lebe wohl!). To the ability to do battle for Germany “Wo dragoner attakiren mufs der stärkste feind verlieren” The dragoons attack then the enemy must know fear. 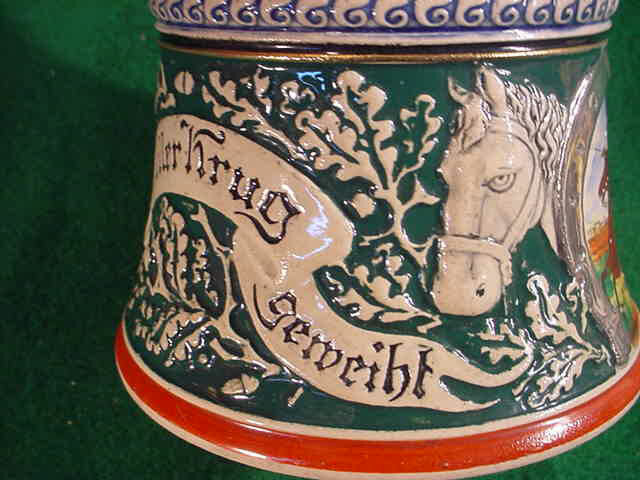 At the top is “Stoltz zu rols die cavallerie auf dem polten spat und fruh”translated to say “Proudly rolls on the Calvary to be fit, ready and early”. 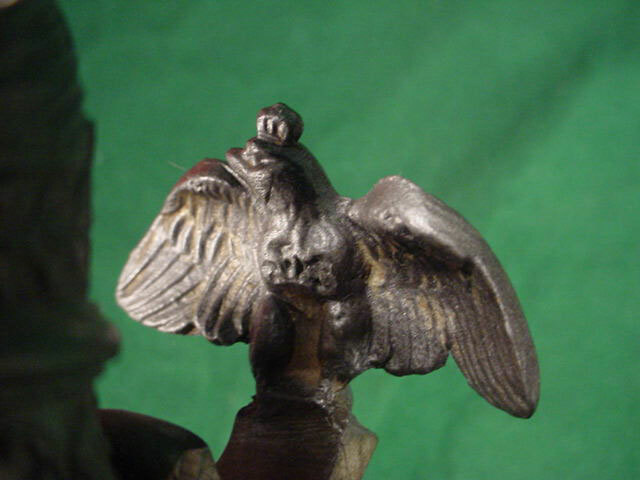 The finial has a Calvary rider on horse and the thumblift has the arms of Baden (the griffin). It measures about 11 ½ inches high. The lithophane bottom has a rather beautiful scene of Tyrolean style hunters with equipment (rifles & dogs) and a maiden in a cheerful scene. None come much finer than this one that belonged to Dragoon Horseman. 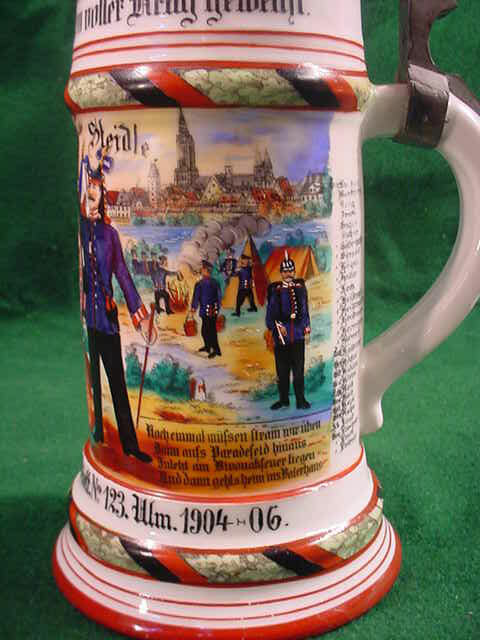 A really great & colorful stein. 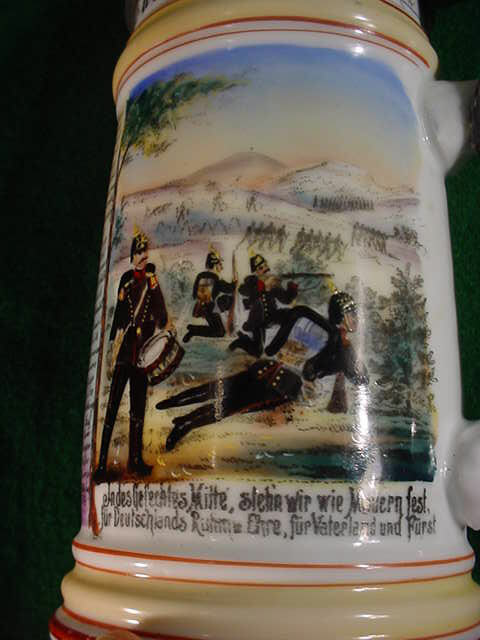 DESCRIPTION: This is a very typical military stein for a two year reservist in Bavarian artillery regiment. 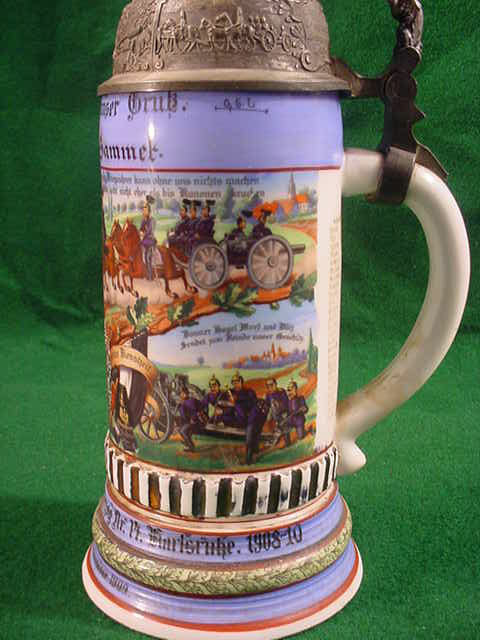 This stein is in vibrant Bavarian Blue with beautiful scenes to each side. One of them comical in that one of the regiments guys is being fired from the cannon, and is on his way through the skies to his Bavarian Heimat (Parol Heimat!) The central scene has the large artillery piece being manned by an artillery team. 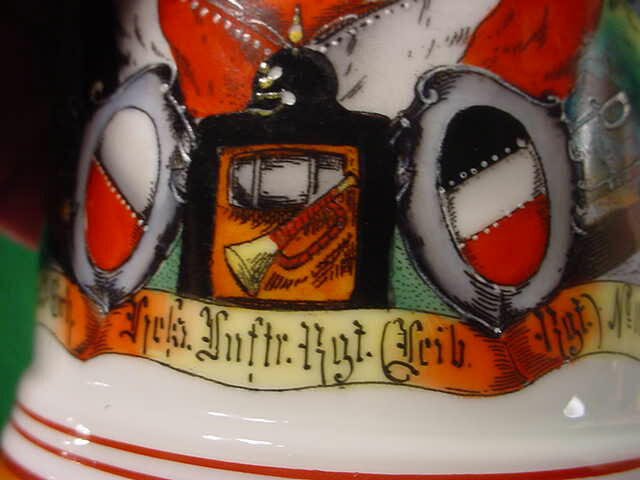 All sorts of patriotic saying adorn the body of the stein, along with the usual “Zur Erinnerung an meine Dienstzeit” translated to say “In memory of my service time”. 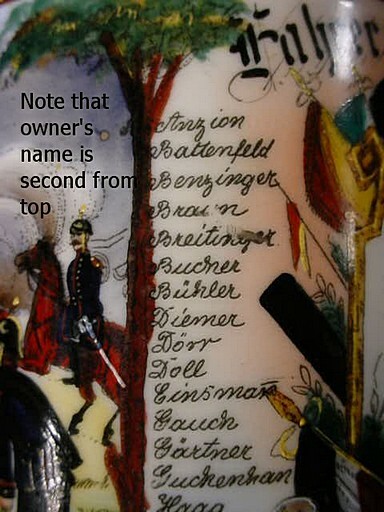 The former owner Obergefreiter Skirsch and the names of his fellow reservists are listed down each side of the steins handle. 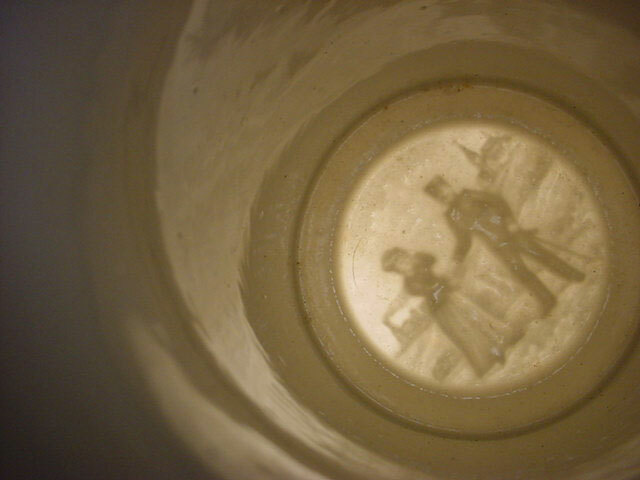 The lithophane bottom depicts a soldier courting a maiden while upon the early evening moon. She stands (Juliet like) on her balcony. 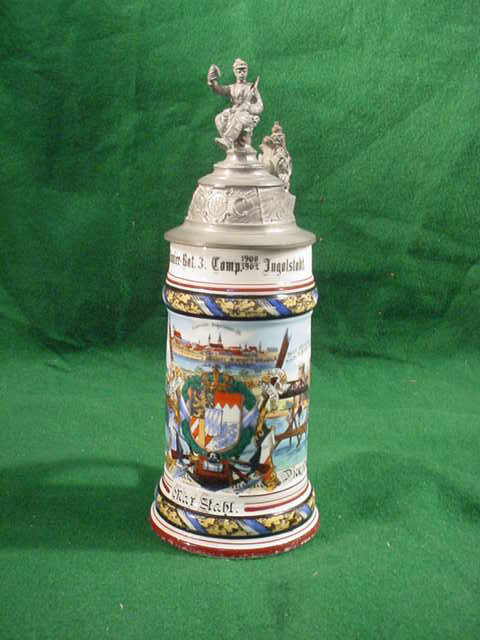 The lid has the crest of courage with the Bavarian shield surrounded by lions while the thumblift is also the Bavarian Lion with shield. The central theme of the cannons also has a nice potpourri of flags, helmet, artillery shell, bugle, bayonet, rifle, field pack, blanket roll, etc. Nice condition through out. Measures about 10 inches high. 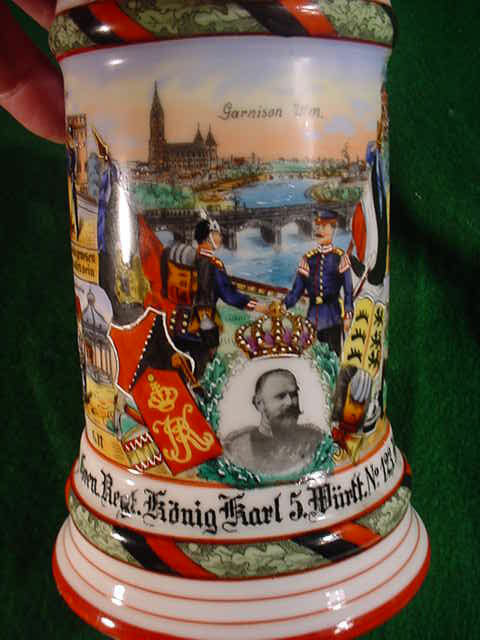 DESCRIPTION: Here is a rare stein for a reservist named Stahl who served in the First Pioneer-Battalion 3rd company from 1900 to 1902 stationed in Ingolstadt. It’s color is the basic Bavarian Blue and it has the Bavarian Crest as the central theme under the Bavarian Crown. Pictures of reservists building bridges are shown on each side of the central theme. And as usual it proclaims in letters “Zur Erinnerung an meine Dienstzeit” (In memory of my service time). 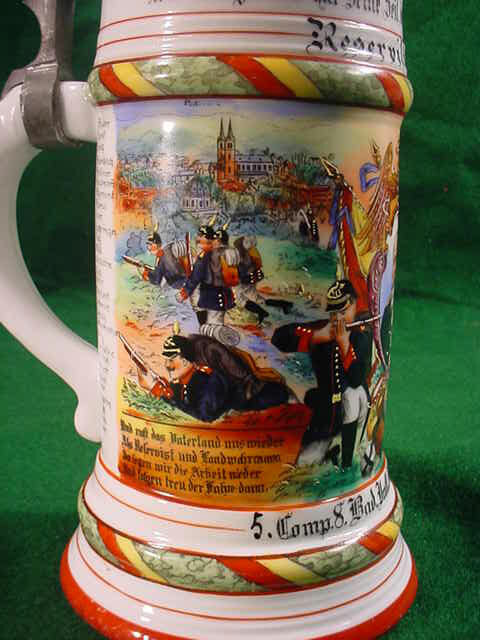 Other patriotic sayings are to be seen within the body of the stein. 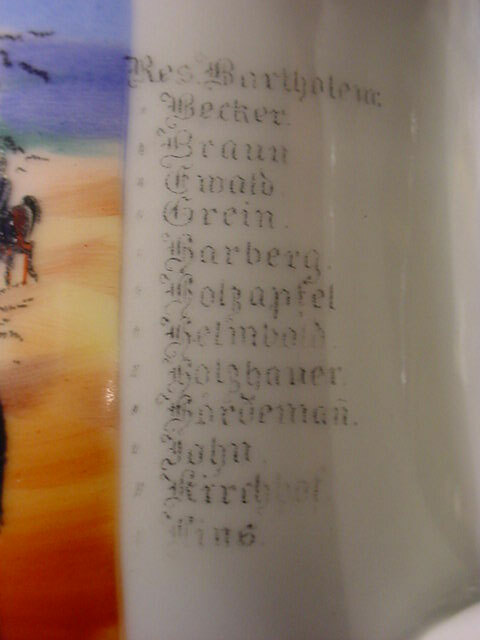 On each side of the handle are the names of all the reservists including Stahl himself. 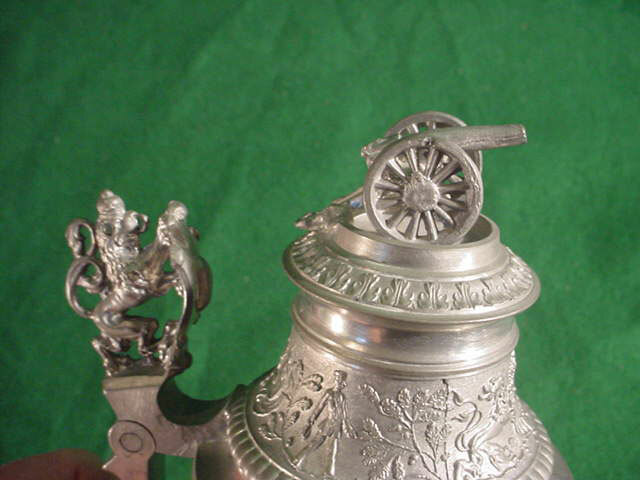 The pewter lid has finial scenes with the Bavarian Lion and shield crest. 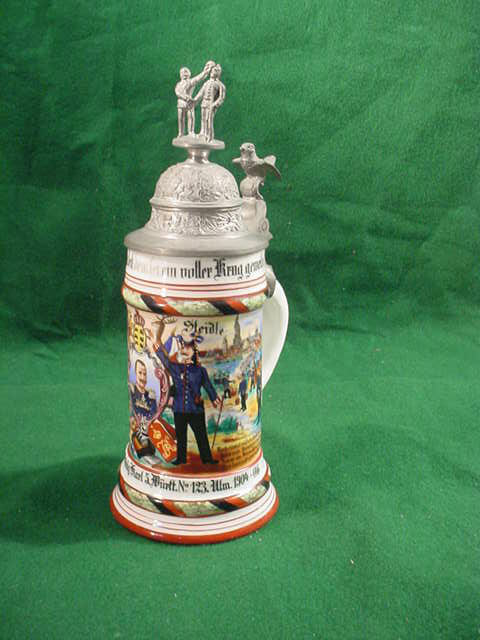 The finial is a seated Bavarian “Landser” with uplifted flask as if to be saluting the Bavarian Fatherland. It measures about 11 inches high. 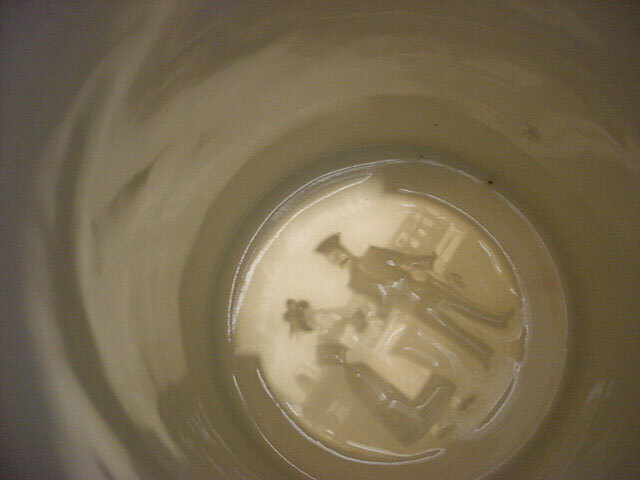 It has a lithophane bottom depicting a soldier who stands at the balcony window of his sweetheart. 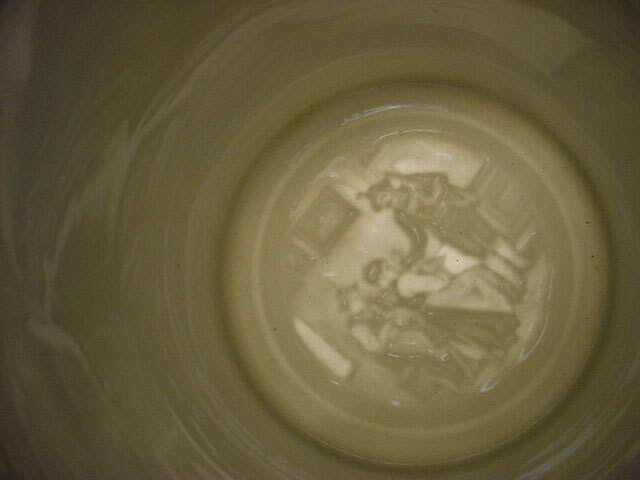 The stein is in top notch condition except for the lithophane which shows a spider shaped crack. You cannot feel the crack so it’s not going anywhere and we are sure it will not crack farther. 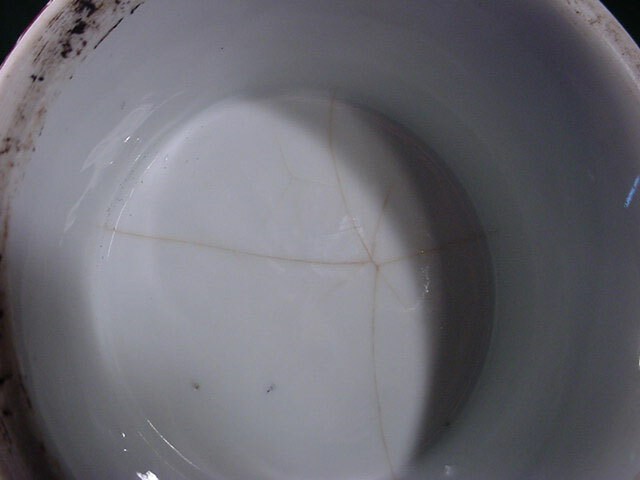 It is not even a crack in the true sense of the word but more of a stain. 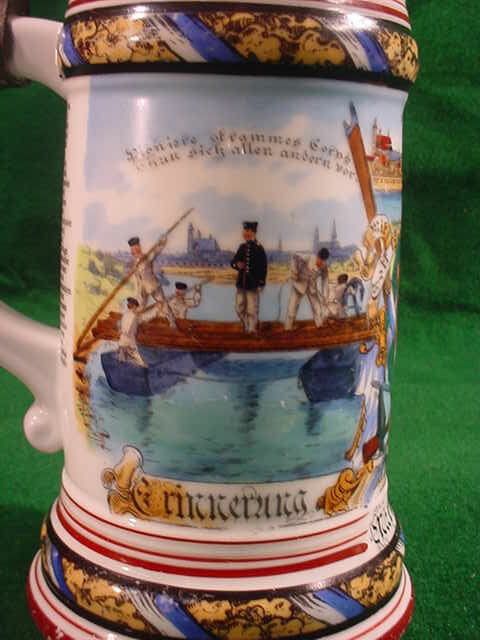 Around the central theme are boat oars and crossed picks and axes with the words “Mit Gott für könig und Vaterland” (With God for King and Fatherland) This is a rare and beautiful memento of better times in Germany. 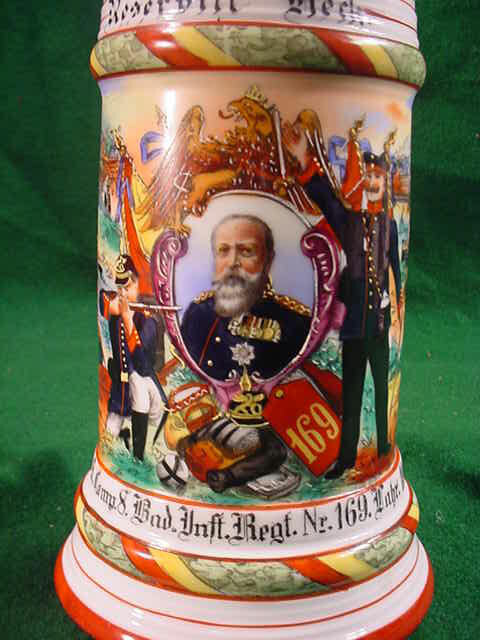 DESCRIPTION: This beautiful beer stein was owned by a reservist by the name of Ewald who served from 1906 to 1908 in the 3rd Company of the Train Battalion No. 11 in Cassel. 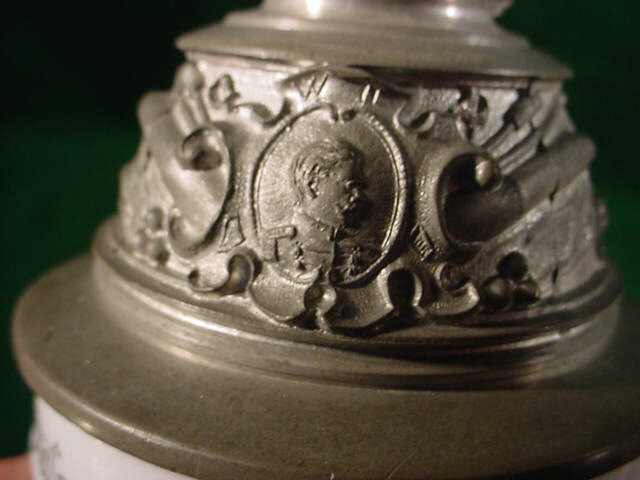 Down the right and left sides of the handle are the names of the “Comrades” he served with. 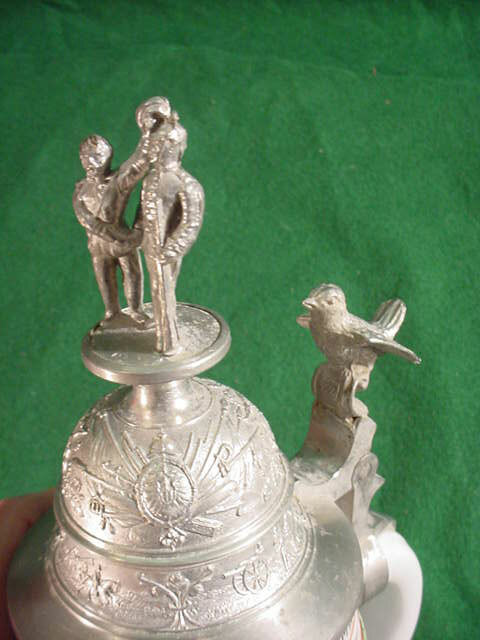 The lid in pewter has a rider on a rearing horse and the thumblift is the national Prussian Eagle. 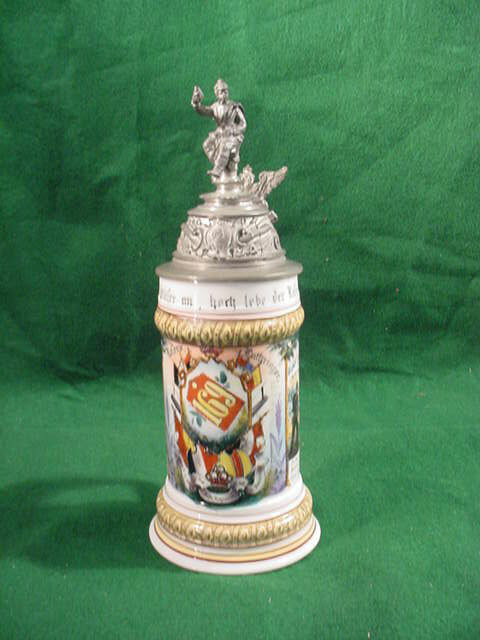 This is a ½ liter stein measuring 12 inches high. 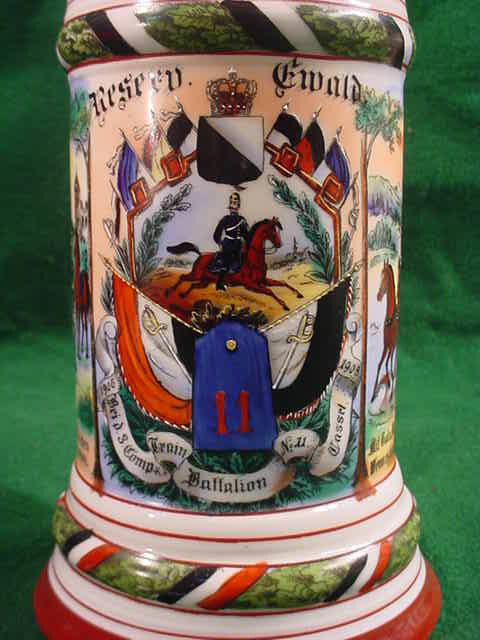 It essentially is a Prussian Stein having the national colors and Prussian colors on flags crossed under the regimental shoulder board as it’s central theme under another horse and rider. To each side of the central theme are scenes of farewell to the maidens and an equestrian exercise. 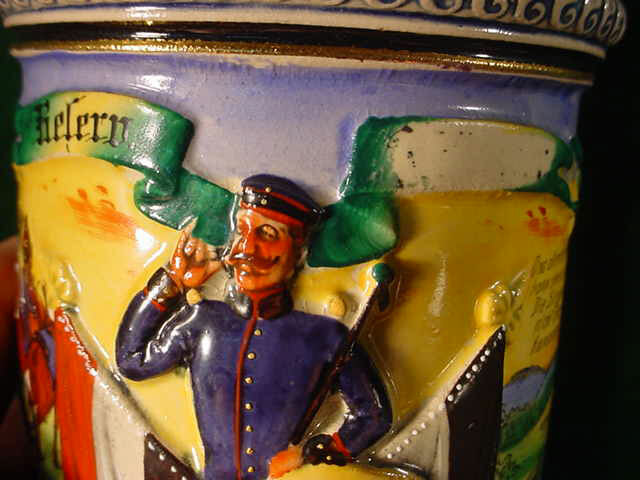 This porcelain stein has a lithophanne bottom with the typical scene of a soldier with a maiden. 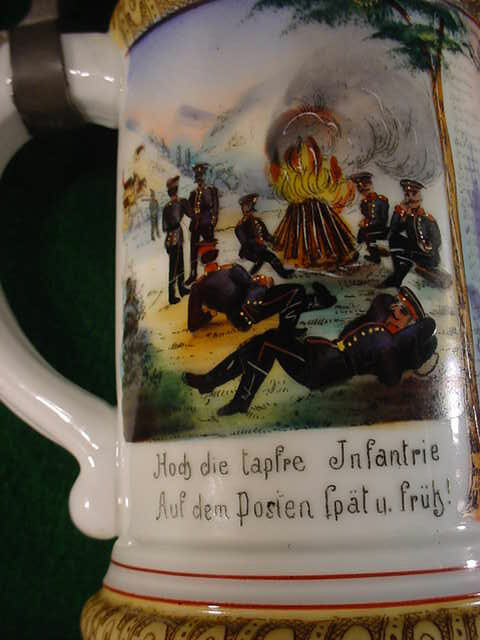 A very beautiful beer stein and rare as to the type Train Battalion. PRICE:�$795.00 Try finding one as good in Germany that reasonable! and now with our special sale you can buy this magnificent one for only $650.00. 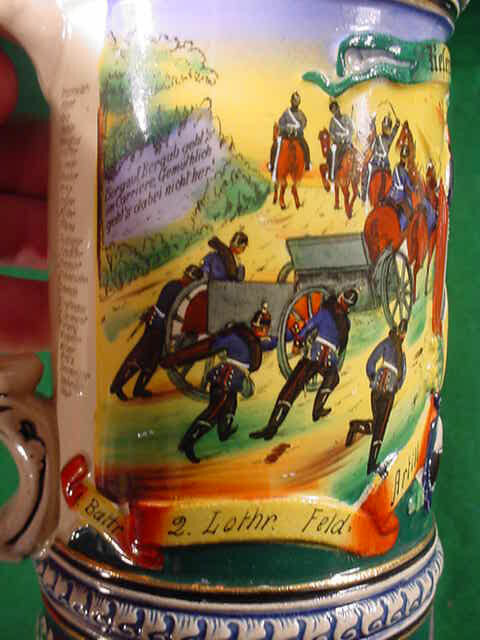 DESCRIPTION: This is a reservist beer stein that once belonged to a Reservist soldier named Luthringer who was stationed from 1896 to 1898 at the garrison near Karlsruhe in the 2nd Company of the 8th Baden Infantry Regiment No. 169. 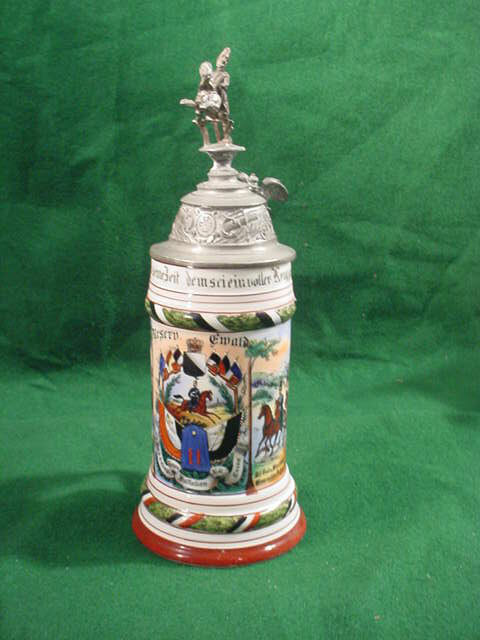 The stein is of course the Baden model with the 169 shown as a shoulder board with other items such as flags, swords, the Baden colors and crown. To the sides of the central theme are beautiful scenes of camp life and field exercises. 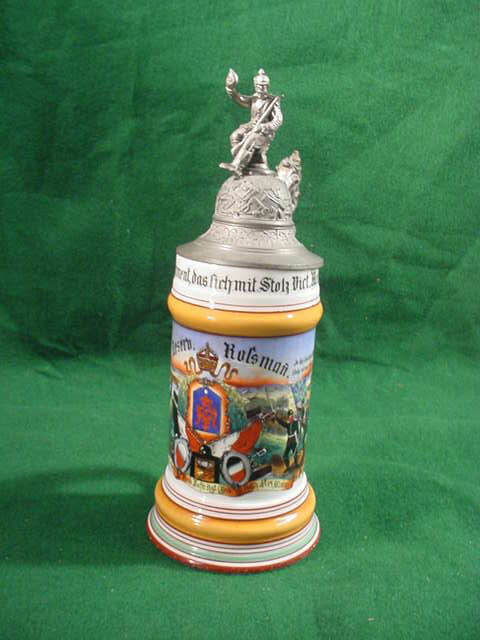 At the top of the stein body is a legend that proclaims “Brothers hold the glass (stein) high to the lives of the reserve men!” The lithophane bottom has a Tyrolean hunter who brings his catch of the day home to his wife and child. 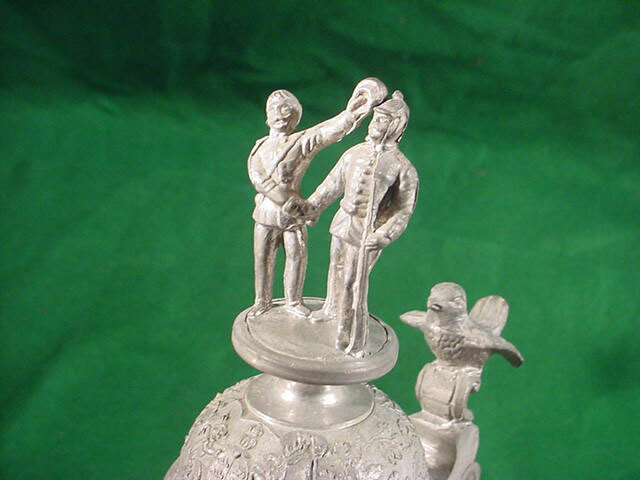 The pewter lid has a scene of a reservist holding a whiskey flask which is held high in salute to the fatherland and reserve comrades. 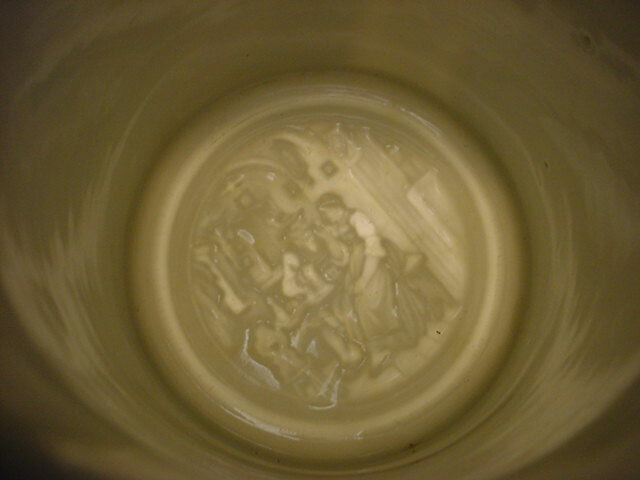 All around the lid are military objects and an effigy of the Kaiser. 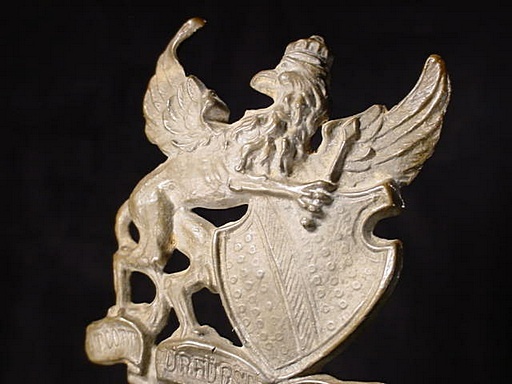 The thumblift is fashioned to depict the Griffin of Baden with the shield. 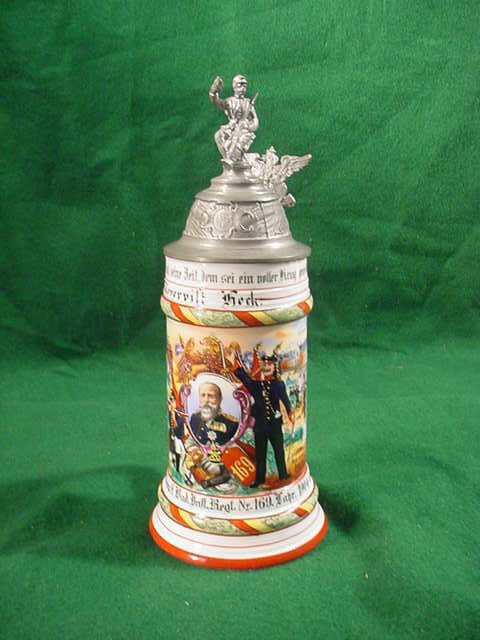 A really good looking stein worthy of the finest collection. 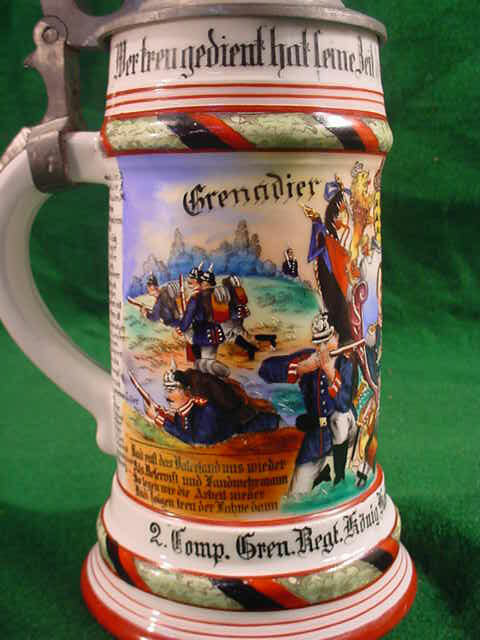 DESCRIPTION: Here is again a particularly fine beer stein having formerly belonged to a reservist who served in a Garrison in Baden. He served from 1904 to 1906 in the 6th Company of the 8th Baden Infantry Regiment No. 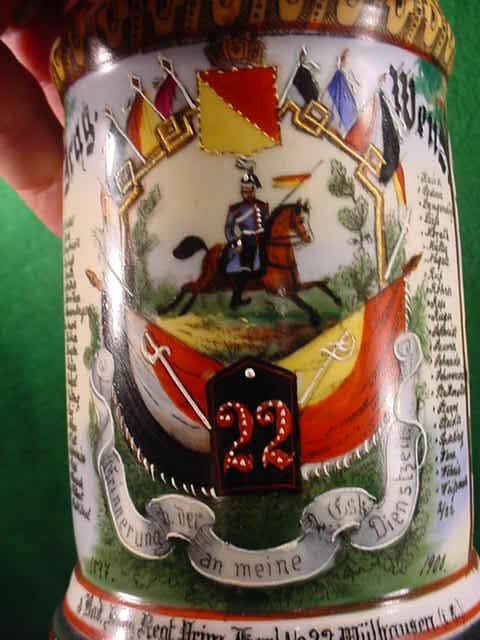 169 His name Reservist Heck is shown at the 2nd ring of the stein’s body under a legend that translates to “We serve loyally through the times and lift this full Krug (stein) in salute”In the center of this stein is the sharp likeness of the King of Baden surmounted with the eagle of the nation. To each side are pictures of reservists in training. There is much hand embellishment in the decal process. 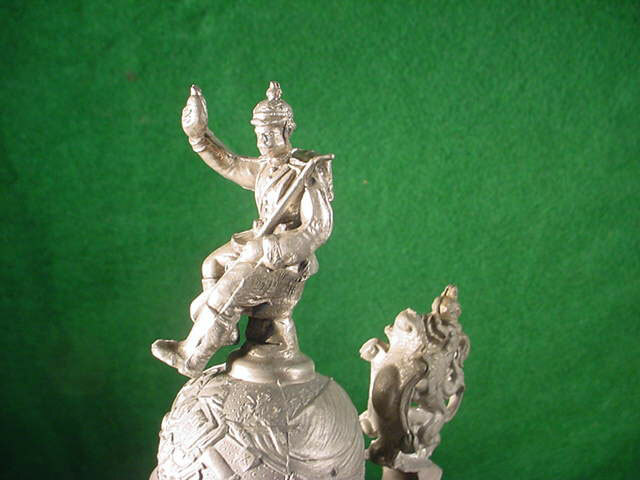 Particularly nice, the lid has a soldier seated as its finial. He holds a whiskey flash high as if to salute his Fatherland and comrades of the company and regiment. 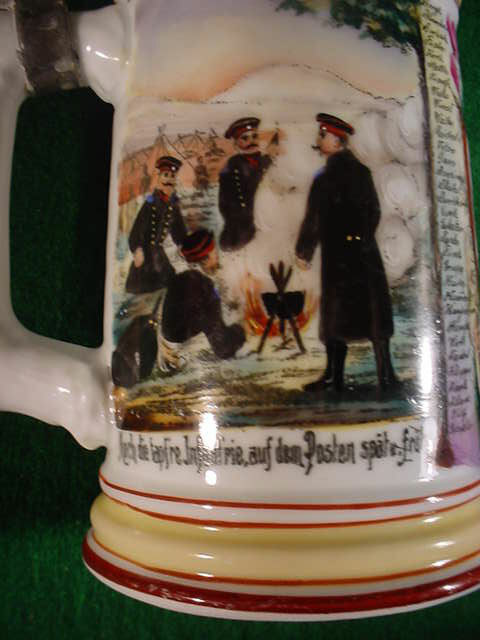 A really superior military stein indeed. 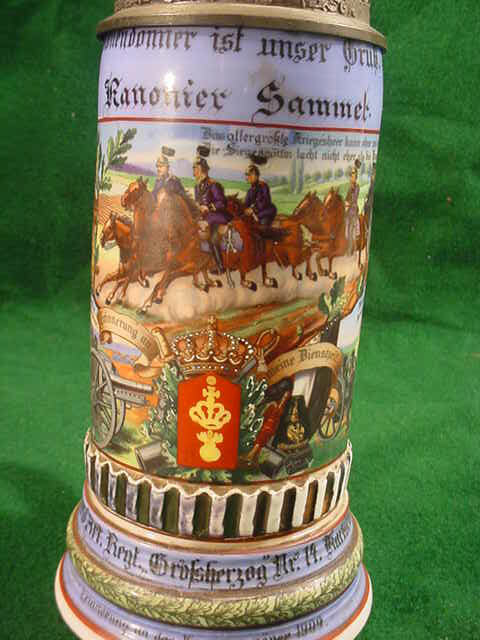 DESCRIPTION: This is a reservist beer stein that once belonged to a soldier named Luther Reichert who was stationed from 1896 to 1898 at the garrison near Karlsruhe in the 2nd Company of the 8th Baden Here is a winner personified! It is the rare pottery type tall 14 ½ inch model with raised semi relief figures. The lid is where the very unusual aspect of the piece comes in. 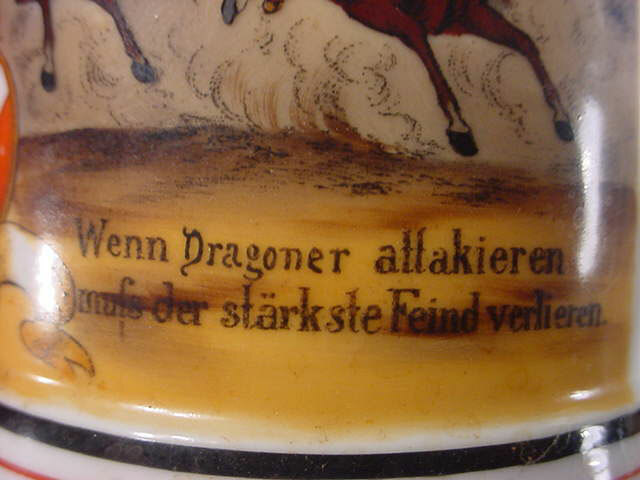 The figures with cannon are often found on this type of stein but this one also has a calvary man on horse galloping as a thumblift. This we have never seen before in 40 odd years of handling these steins. Highly unusual but it is original and nothing has ever been changed. 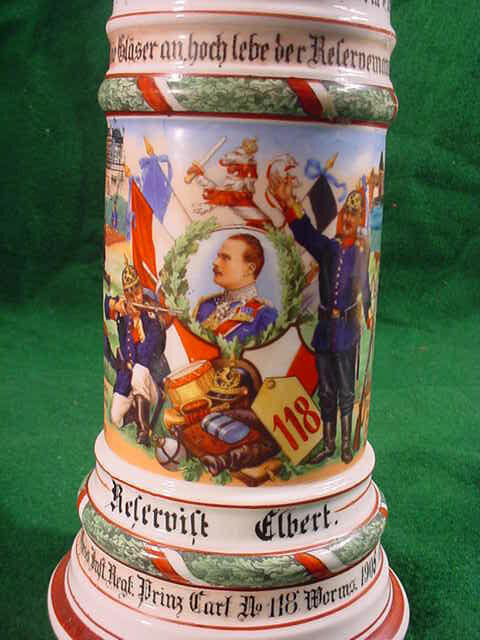 This stein was owned by a reservist whose family removed his name from the banners. Why??? Probably they were embarrassed that they sold this important family memento. Possibly in the post war years when folks were desperate due to the hard horrible war’s finish. 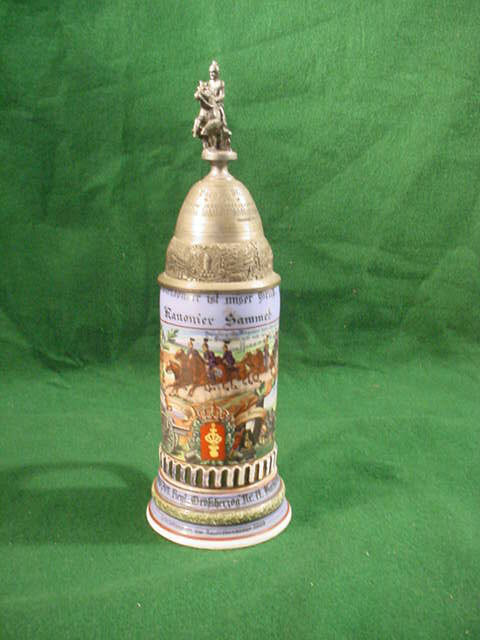 The stein lid has the soldiers manning a cannon on a platform. 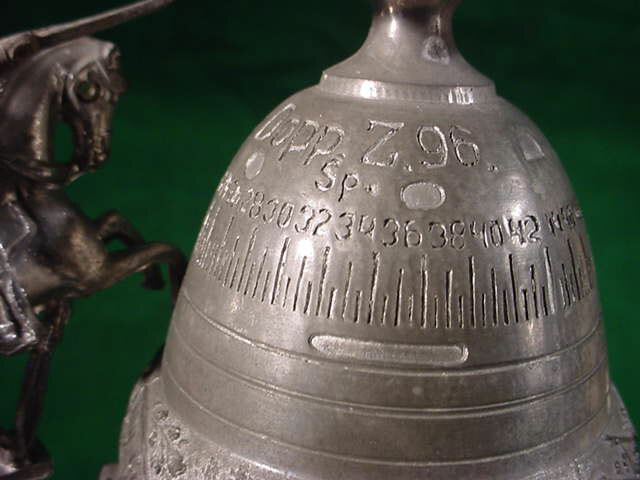 This conical top emulates an artillery shell with its various numbers below this. Many scenes of artillery exercises. The sides of the handle have the names of all the reservists in the company which was the 1st Battery of the 2nd Lothian Field Artillery Regiment No. 34 stationed at Metz. This man served from 1910 to 1912. Beautiful scenes of the artillery mans life in the service are shown in nice clear illustrations with patriotic sayings. 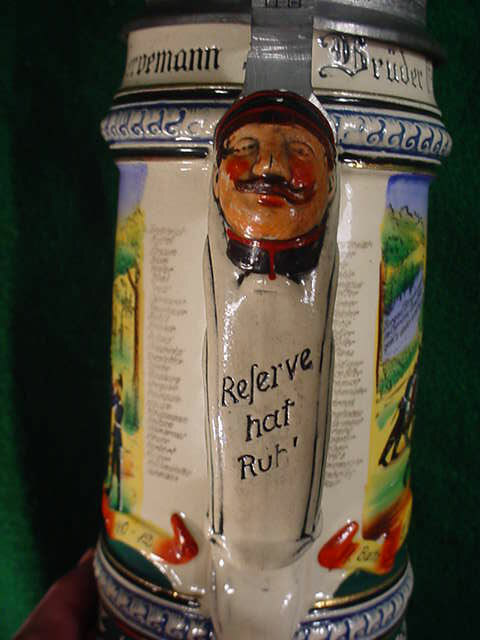 This is a ½ liter stein and has as it’s central legend (translated) “Brothers lift the glass (stein) and salute the lives of the reserve men” “Bruder stolz die glaser an hoch der leben das rervemann!” On the handle is a face of a soldier with the words Reserve hat ruh! (The Reserve is Ready) A beautiful picture of a rider similar to the thumblift can be seen in a depiction of a horseshoe at the bottom center. This was a Calvary supported Field Artillery Regiment (the 2nd). 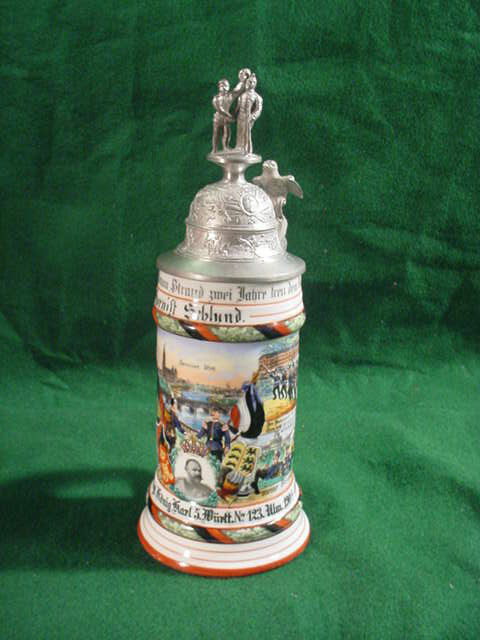 A very rare and different stein. 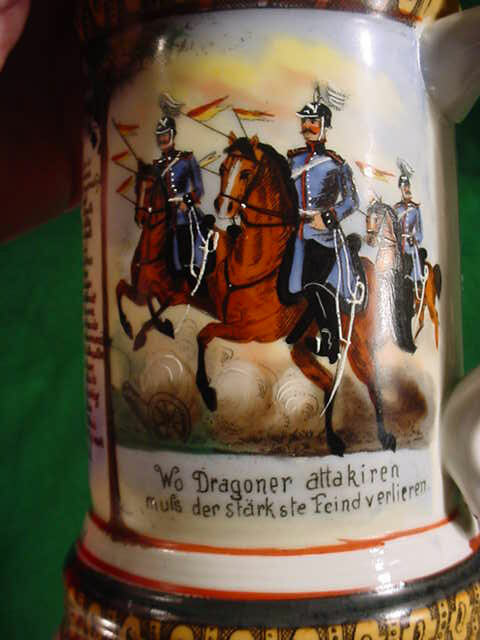 DESCRIPTION: This is a rare dragoon stein for a reservist named Zimmer who served in the dragoon Regiment No. 14 in the Colmar Garrison from 1901 to 1904. 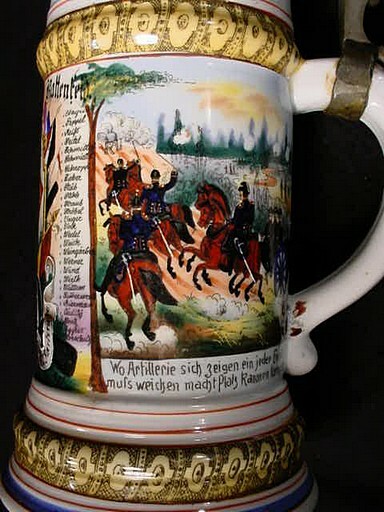 It is a beautiful stein with scenes of dragoons with maidens and mounted dragoons in a training exercise. The Calvary charge to each side of a central theme of a mounted dragoon with the shoulder patch of the 14th surrounded by flags, helmet, saddle, sabers, and the words (translated) “In memory of my service time”. 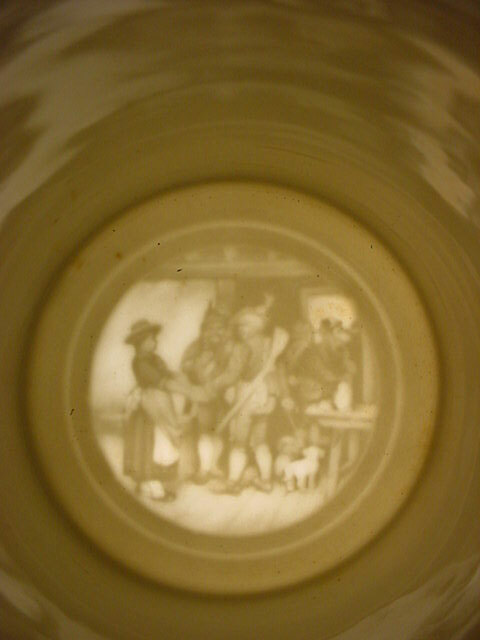 The lithophane bottom has the scene of a Tyrolean hunter bringing home his catch to his wife and child. 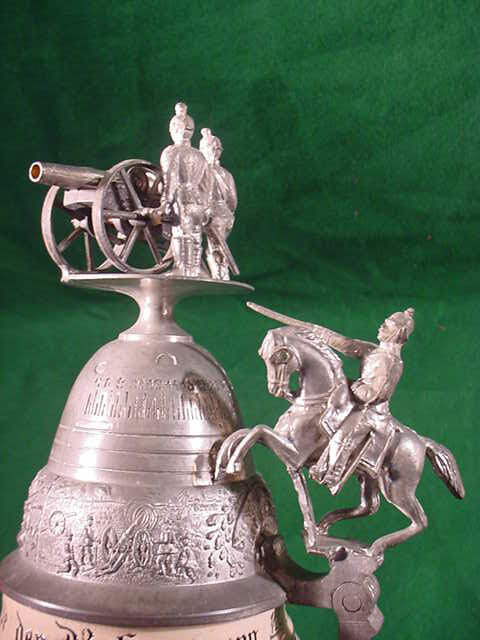 The lid is of pewter and has the mounted dragoon and the body of the conical lid has the various implements of military usage - field packs, bugles, helmet, flags, rifles and bayonets. 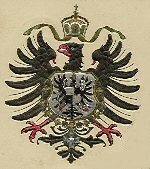 The thumblift has a depiction of the Imperial German Eagle. 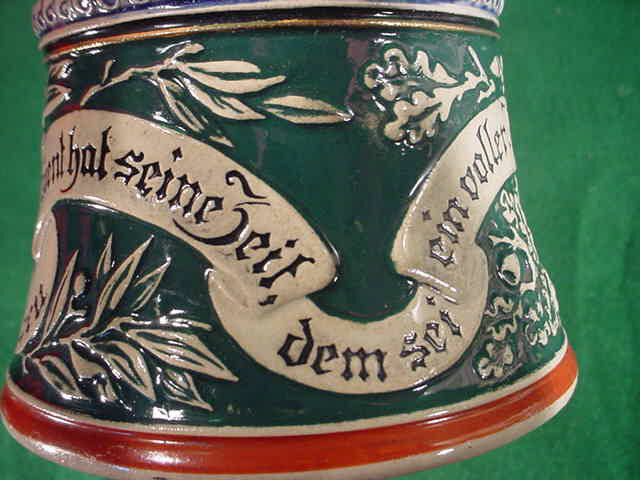 Patriotic sayings adorn the body of the stein. The lid on this one is a bit loose but isn’t going anywhere (sits well). It measures about 12 inches high. 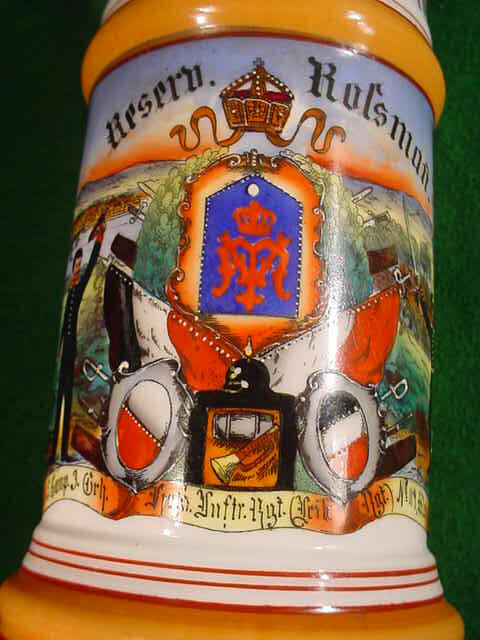 DESCRIPTION: This is a particularly fine example of a reservist beer stein. Just as nice as they come, nice clear pictures in vivid color. It formerly belonged to a reservist named Elbert who served his reserve time in the 11th Company of the 4th Garrison Hessian Infantry Regiment Prince Carl No. 118 stationed at the Worms Garrison from 1905 to 1907. 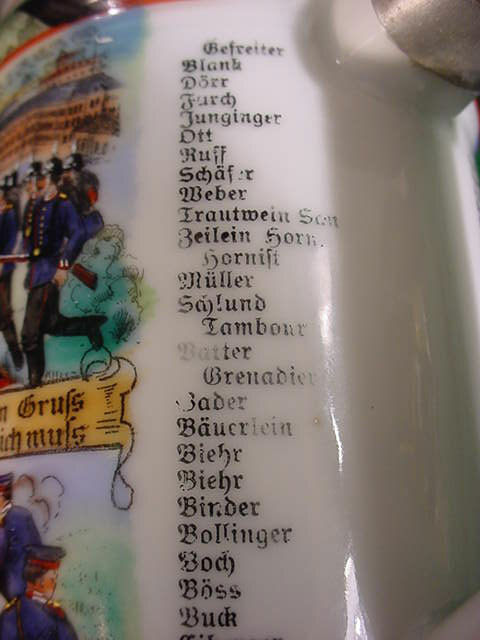 It is a 5 liter porcelain stein. It is in fine condition except for the fact that the lists of regimental comrades going round either side of the handle are rather obliterated to some extent. Other than that the pictures on each side of center are crisp and clear of soldiers and the town of Worms. The central theme is Prince Carl himself of Hesse. 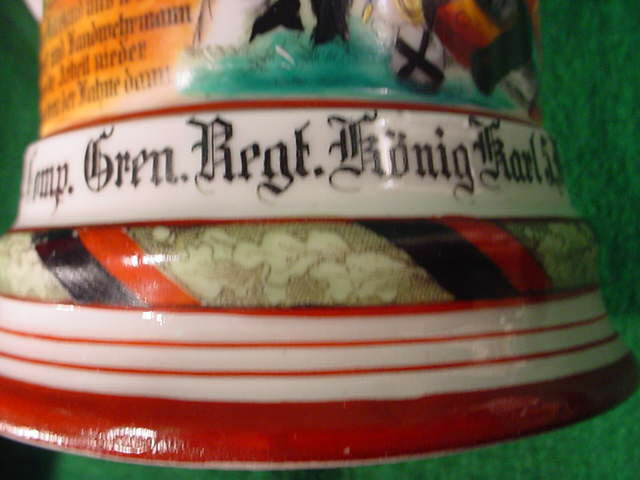 There are various other designs surrounding the prince such as helmet, drum, bugle, field pack and shield with the colors of Hesse and Prussia. The shoulder board of the 118th is also seen as the major theme. 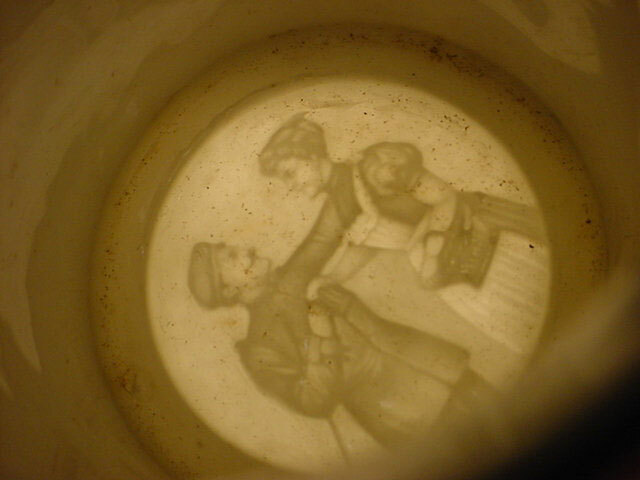 The lithophane bottom is a typical scene of the soldier with a maiden. 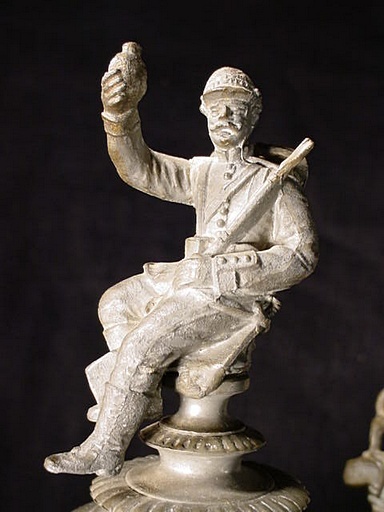 The thumblift has the seated soldier with his rifle and whiskey flask that he lifts in a greeting to this comrades of the 118th. 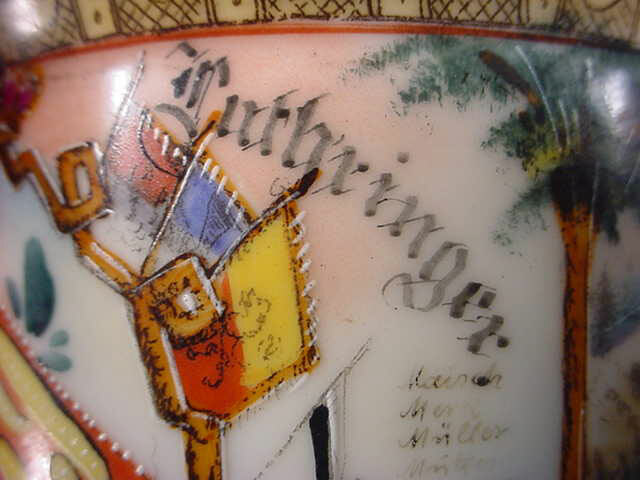 Various patriotic legends can be seen around the raised porcelain rings at the top edges such as a salute to the prince and his named regiment and a call to the brothers to lift their steins high in respect to the reservists. An exceptional historically important piece that is also very beautiful. 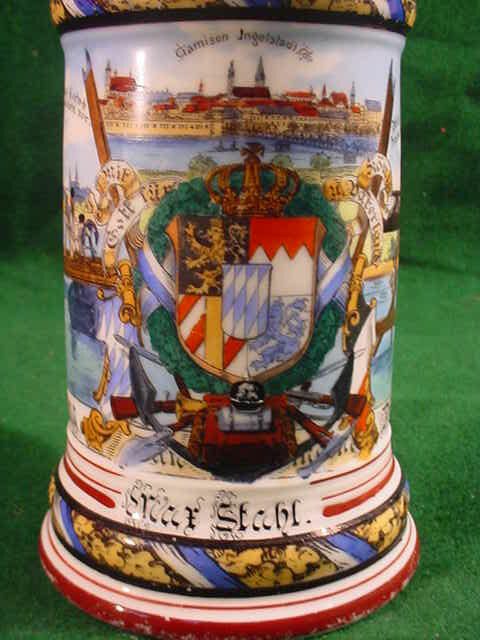 DESCRIPTION: This is a stein with absolutely gorgeous blue coloration. It is basically an artillery stein in the classic mode. It has the conical shape of an artillery projectile. At its top with all the numerical designations and nomenclature and directly below that are scenes of artillery interest. 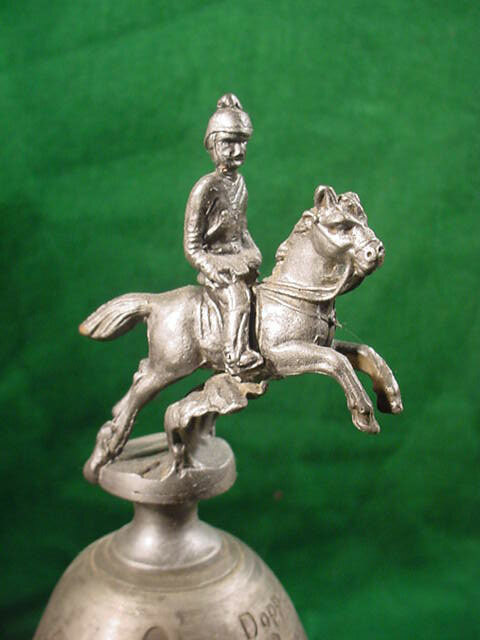 The finial is a mounted Calvary soldier on rearing horse. 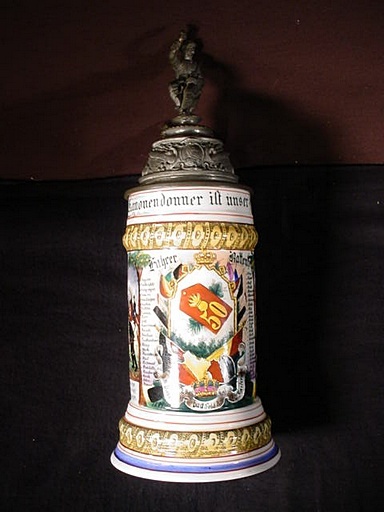 The body of the stein is designed to emulate an artillery shell also with the ring around the center bottom. The mans name was Samimet who had the rank of “Kannonier” and served in the 3rd Battalion Regiment No. 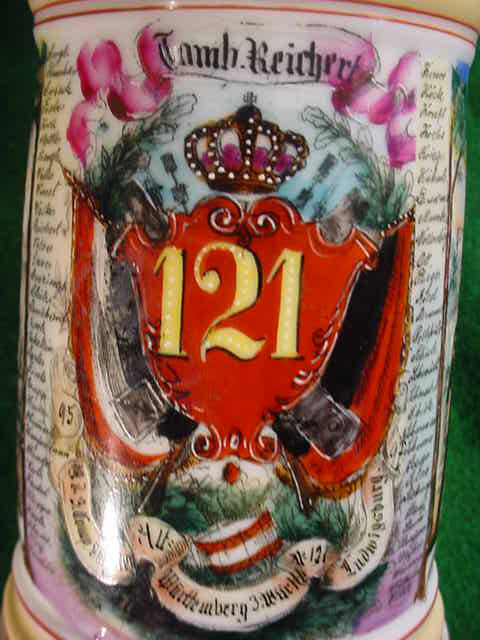 14 at the Karlsruhe Garrison from 1908 to 1910. 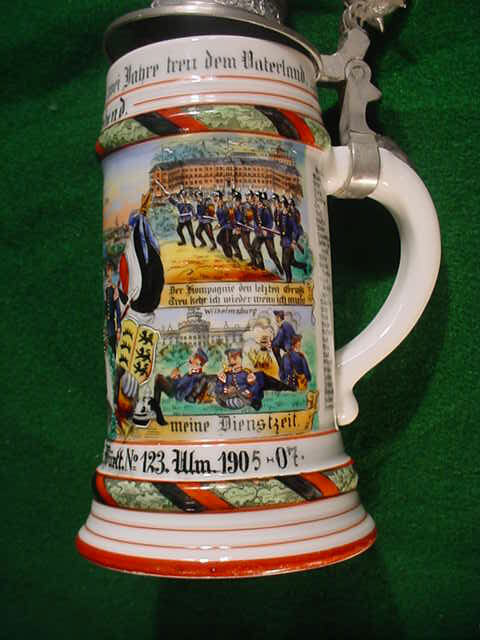 He bought this stein for his souvenir and remembrance of the Kaiser Maneuvers of 1909. 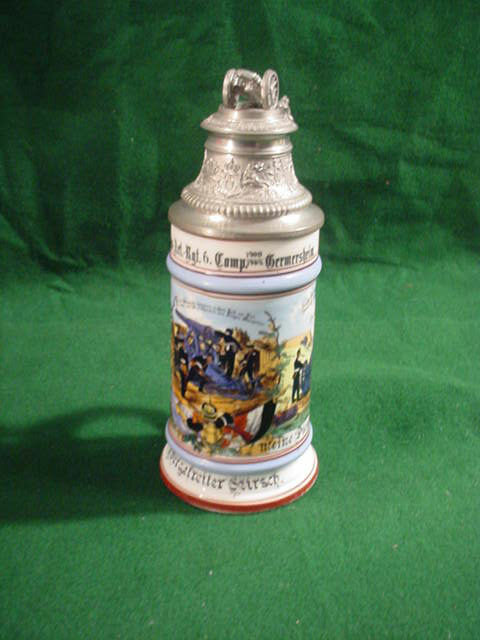 The stein is adorned with great pictures of artillery men surrounded by Calvary and legends written in old German lettering. The main legend being “Kanonen donner is unser gruss” (The thunder of the cannon is our greeting) Other sayings are “Campaigns cannot be won without us and victory cannot be won without the cannons roar” and “Our cannon sends thumber, hail, death and lightning to the enemy!” and “It is time again to take our training and camp outside. We lay at last at the camp fire and then return home” The lithophane seen in the bottom has the soldier with his lady (typical). The lid is a bit loose on one side but is not going anywhere. 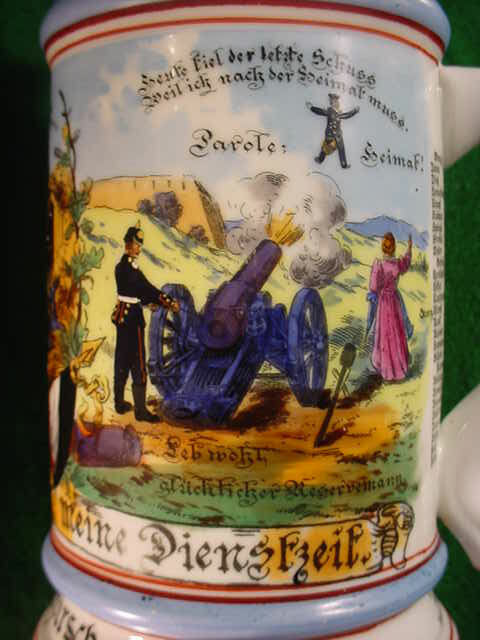 DESCRIPTION: This is a great beer stein from elite artillery Regiment Number 50 stationed at Karlsruhe. It belonged to Fahrer Battenfeld. It is 12 inches high from the bottom to the top of the upraised canteen held up by the soldier at the top of the lid. 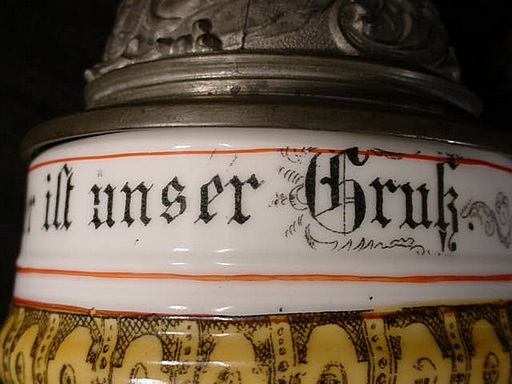 “Kanonen Donner ist unser Grüss.” This is the motto around the top of the ceramic portion of the Stein. 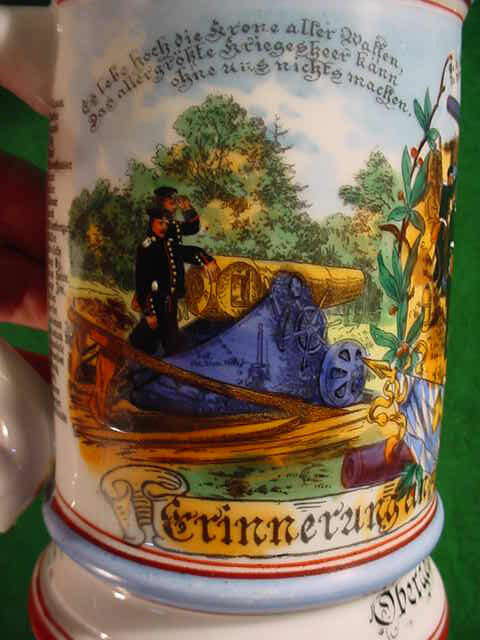 This translates to “The cannons’ thunder is our greeting.” It is a very colorful stein with sharp vibrant tones. The only thing that stands between its being in perfect condition is that the lid has been repaired. It was professionally done and is only noticeable when inspecting the inside of the lid. 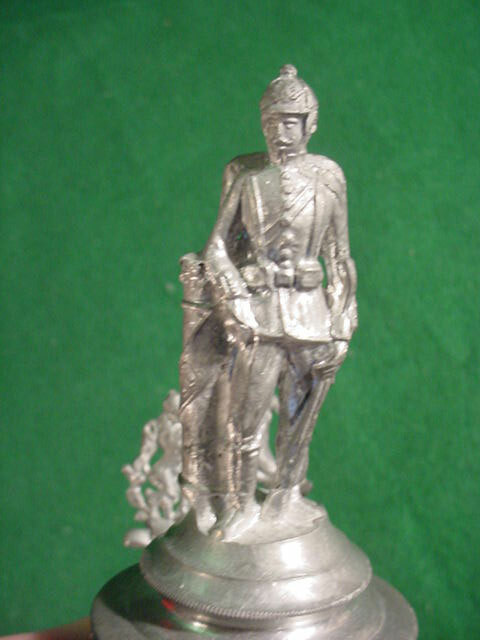 The spike is also missing from the pewter soldier's head. 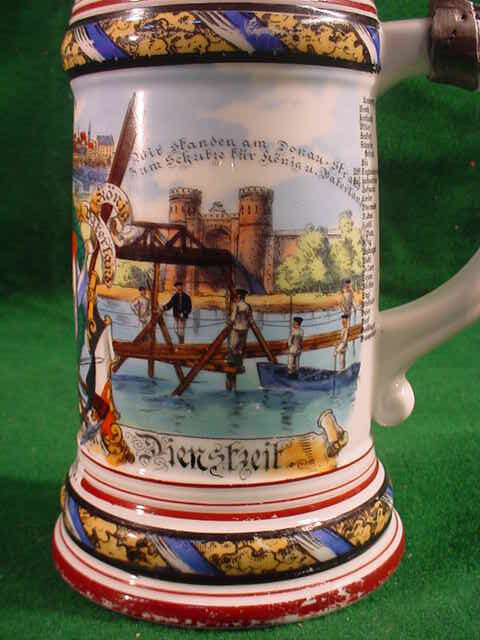 Otherwise, it's in fine condition and a great-looking beer stein. 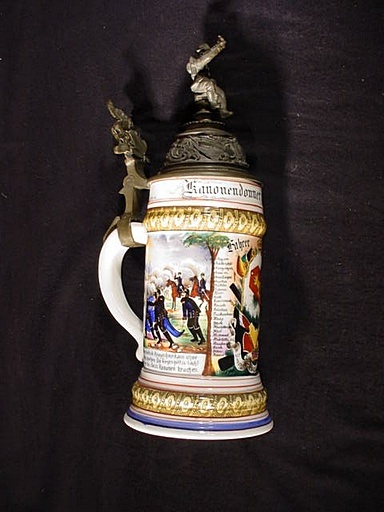 It has the Baden griffin on the thumb lift, and it has a great lithopane bottom of the Jäger’s departure. The name of the former soldier-owner is seen at the front design over the 50th unit shoulder-board designation. He was as the title indicates, a Fahrer, or driver. He probably drove the vehicles that towed the cannon to the front lines. 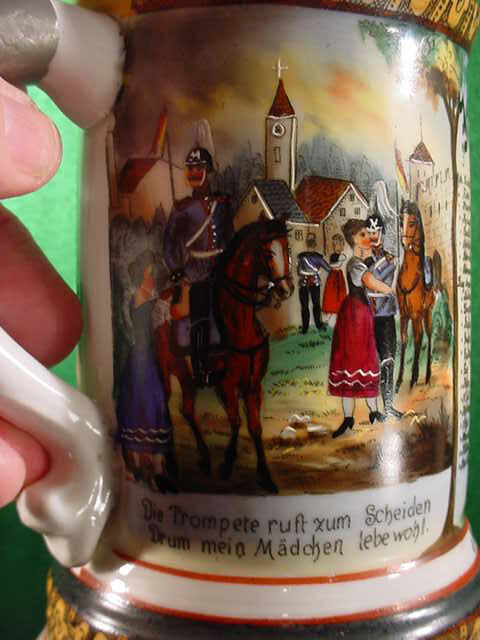 This is a really great beer stein and would grace an Imperial collection.